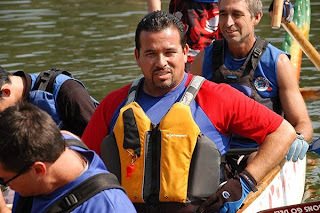 Space Dragons Dragon Boat Racing Team: Paddler Spotlight - Phil! Italian, Asian and Salvadorian Food (pupusas). For fun, to stay fit, to network and to check out all those gorgeous Asian (and other) chicks. I like white meat too! I am a better paddler when there is no drama in the boat. Big Long Beach, master’s race, we started 30 seconds after all the other teams and yet we paddled so hard that we caught 3 other boats to finish 4th. We lost the race, but we fought until the end – We never felt defeated and never were! Yeah!!! I want to be as good as Wade, Rod, John Lai, and the true animal of this team Princess Pearl! Scott Matsunami for bringing me to this team, Deej, Arleene, and Janice for welcoming to the team and Ceez for teaching me the art of paddling. I was born in MADRID, SPAIN. I grew up in BARCELONA, SPAIN and when I came to California I was raised by a Gypsy family…. (not really, but I just wanted to mess with Princess Pearl) I was actually born in San Salvador, Central America and came to the US when I was 16 years old.